Apologies for no post yesterday. I was on a bus all afternoon with no access to a computer. You may be aware that there is a hurricane barreling into the eastern seaboard throughout the weekend and I have been up since dawn helping my parents, family and friends stow away watercraft, loose objects, patio furniture and garden gizmos. 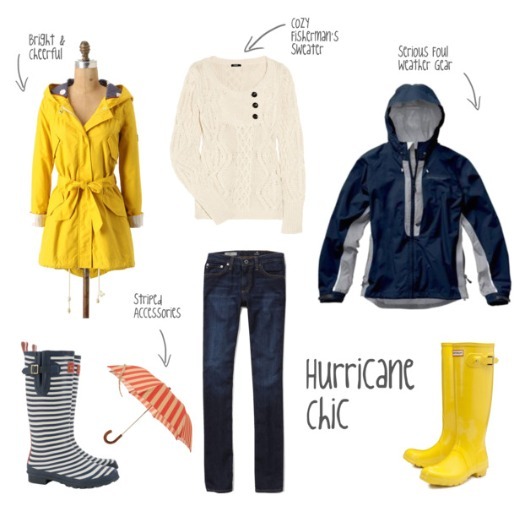 In honor of the wet weather ahead I've thrown together two outfits: one is more playful and clearly for lighter weather and the other is for serious weather protection. Don't expect anything too chic from me over the weekend. Most of my lovely things are back in the city so I'll be wearing a mismatch of items. Thanks to my stalwart yankee family I've pieced together some weather protection: an old, mildew-stained sailing jacket and my first pair of adult-sized wellingtons (the right boot has a huge gash along a foot seam which is patched together with duct tape). Real classy.